Genuinely the coolest lanyard I've seen at a conference: it had the programme, wireless internet log-in, campus map, a QR code for the updated programme on the event wiki and a barcode giving access to the university library. On Tuesday last week I went to my third (and the eighth overall) Mashed Library event at the University of Lincoln. It probably goes without re-saying that I love these events: both as an opportunity to expand my knowledge of what can be done with technologies in libraries and as a chance to network and swap ideas with like-minded information professionals. Pancakes and Mash (named as it fell on Shrove Tuesday) kicked off with an opening keynote from Gary Green from Voices for the Library, talking about the role of social media and data in his team’s project to save public libraries in the UK. I won’t go into much detail here, but please do go and check out the website and at least read their guide to 10 things you need to know about library closures / campaigns. It’s not unusual to find obtaining rights to use data which belongs to your own institution as complicated as using external data. After lunch, I then went to see Alison McNab talking about De Montfort University Library’s Mash at Lunchtime events – see their blog at http://librarymashups.our.dmu.ac.uk/. Essentially this is a platform DMU is using to share knowledge about technology in libraries internally (within library and across the institution) and represents an interesting model for developing a technologically aware community. This was followed by an interesting chat led by Stephanie Taylor about the ways in which librarians and geeks can work together: although it soon grew clear that library-geeks talking to computer-geeks was a better analogy, as most of the communication challenges were two way! Shot of the University of Lincoln Great Central Warehouse Library interior. To finish, a few of us went to have a look around the interior of the Great Central Warehouse Library of the University of Lincoln. Rather appropriately for a Mashed Library event the architecture is a beautiful combination of old and new, with modern glass panels in amongst the old brickwork, and there’s some ambitious use of new technologies like information screens to convey library information and get feedback. Also on the techie side, I have to say that this conference was the best I’ve ever attended for wireless internet access and availability of power points for charging laptops: good work Lincoln and the organisers! This event was great fun and has yet again extended my knowledge of what libraries can do with data and information. However, one thing that was discussed both at the (un)conference and on the associated Twitter feed, was that many of those attending weren’t funded by work (in my case a combination of different reasons meant I didn’t feel it was appropriate to ask). I encountered mixed feelings about this: the Mashed Library events in general always seem affordable for those living locally, which is great, but it’s also a shame that for most of us this kind of developmental work just isn’t central to our job descriptions. In tough economic times, however, perhaps that’s inevitable. This post was originally written by me and posted on the University of Leicester library blog at http://uollibraryblog.wordpress.com/2010/07/12/mashed-library-liverpool/. It is replicated here to preserve this blog as a central record of my professional development. While I’ve not jumped in and used any of these services straight away, both the Mashed Library events I’ve been to have really opened my eyes to the wide variety of options available to me for using and integrating data on the web. You may see a few of these services turning up on the library website as we get further down the line with the Plone rollout! To finish the post, here’s a video of Liver and Mash, which I think catches the atmosphere and creativity of the event pretty well: YouTube video of Mashed Library Liverpool. 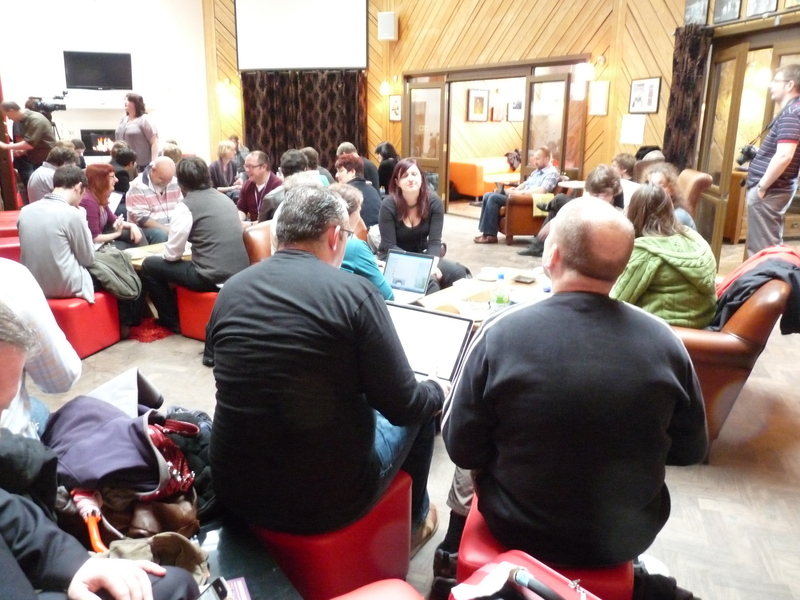 As well as commenting on the more formal learning I took from Mash Oop North, explored in my blog posts on the opening sessions I also wanted to take time to comment more generally on the unconference. I was funded to attend Mashed Library by CILIP Yorkshire and Humberside – I’m writing a report for their newsletter in ‘payment’ and because I was travelling from Nottingham rather than Sheffield, where I study, they generously offered to put me up in a hotel before the event to allow me to avoid a super-early start. I’m really glad I got to go to the event early as the Monday night getting-to-know-you meal and drinks were invaluable in finding my feet and getting to know some delegates beforehand. I commented on my previous posts that Twitter was useful in following ideas being generated and discussed elsewhere in the event itself, but the pre-show was great in that I got to meet up with people who I knew from Twitter beforehand. It was great to put people to IDs / pictures of faces, and I found a few more interesting people to follow as well. I’ve always tended to arrive at events like this on the day, and I think I might actually arrive early wherever possible in the future, as it really helped me settle in. The conference was brilliantly organised: not only were we asked to indicate our own experience and interests beforehand, but we also got to vote on pizza toppings for the lunch, and influence which of the opening sessions ran parallel to each other. I missed the Yahoo! Pipes session, as it ran opposite one my choices, but fellow-Twitterer @spiky7 and I had a play with it in the afternoon and created an exciting tool for stalking conference organiser Dave Pattern. Unfortunately we had to edit out his #mashlib09 tweets as they overwhelmed the timeline! If you’re interested in learning more about Mashed Library then it’s well worth visiting the Mash Oop North blog, where there should be further updates on the event. Next year’s event will take place in Birmingham, entitled Middle Mash, and I’d recommend attending if you can find a place – this year’s sold out with speed! Note: the picture shows the Ikea rat on display at the Rat and Ratchet, which we called into on Monday night. I have the exact same toy rat, so he made me feel right at home.